An op-ed about the Ten Commandments monument controversy by former Oklahoma Gov. 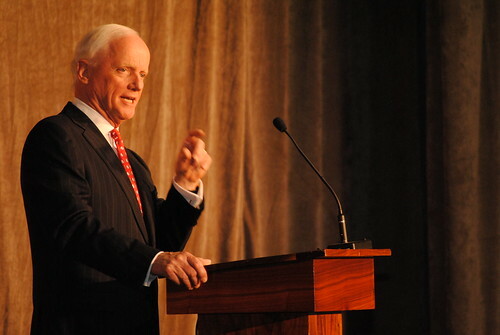 Frank Keating has an illogical premise and contains distorted historical information. One question is whether the distortion is deliberate or just based on a basic lack of knowledge about the state’s history, a lack of a careful consideration of logical human behavior and, well, a lack in understanding just how the concept of time works. The commentary, which basically argues voters should repeal a section of the state’s constitution so the Ten Commandments monument can remain on state Capitol grounds, appeared recently in The Oklahoman. The newspaper’s editorial board has also urged a repeal of the section. Keating and the newspaper are obviously free to argue for a repeal of Article 2, Section 5 of the constitution, of course, but they should be called out on their faulty logic. Let’s call it what it is: Keating and the newspaper’s editors want an undeniably religious and exclusive monument supporting the Judeo-Christian tradition at the Capitol. They apparently don’t care that if their argument prevails the state will no doubt face an expensive lawsuit at the federal level. In a recent 7-2 ruling, the Oklahoma Supreme Court argued that the section means the monument must be removed. The court has upheld its ruling. The monument was put up in 2012 and paid for by the family of state Rep. Mike Ritze, a Republican from Broken Arrow and a Southern Baptist ordained deacon and Sunday school teacher. Ritze and others have made the strained argument that the Ten Commandments monment represents an historic legal framework for Western culture and so that’s why it belongs at the Capitol. They have also said the monument is similar to the one at the Texas state Capitol. The U.S. Supreme Court in a 5-4 vote has ruled that monument can remain in place. First, the Oklahoma monument is obviously religious. The Ten Commandments come from the Bible. Placing such a monument at the Capitol obviously is in violation of any reasonable reading of Article 2, Section 5 of the Oklahoma Constitution. Second, the Texas case is not at all similar to the issue in Oklahoma. The monument in Texas went legally unchallenged for 40 years thus solidifying a peculiar but specific historical claim to legitimacy, one with which I don’t agree but have to accept. It’s also part of a larger display of other monuments and markers. That isn’t the case in Oklahoma. The motivation for the monument here is singularly religious-based on the Bible and exclusive of other religious and secular traditions and beliefs. Now some state leaders, along with Keating and The Oklahoman, want voters to repeal Article 2, Section 5 in the constitution. Keating and the newspaper make the argument that the section is based on the failed Blaine Amendment to the U.S. Constitution in the late 1800s. Many states adopted similar language in their own constitutions. Some considered the Blaine Amendment to be an anti-Catholic schools measure at the time, but that obscures the issue of the separation of church and state and the issue of providing free public education to all children. Those were two basic intentional concerns of the amendment as well. A second suspect minority that came into the sights of our early Legislature was my faith community, Catholics. About the time that legislative Democrats were passing odious “Jim Crow” laws and attempting to restrict the public use of alcohol so that consumption of wine at the Catholic Mass would be discouraged, Oklahoma’s constitution mirrored those of 34 other states by including a simple proviso intended to retard the further spread of Catholic education and Catholic values. Keating is entirely wrong. Go back and read the section of the state constitution I cited. It contains no mention of Catholicism. The section has more in common with the First Amendment in the U.S. Constitution and separation of church and state than any concerted effort to specifically “retard the further spread of Catholic education.” The implicit comparison of Article 2, Section 5 to Jim Crow laws in Keating’s commentary is itself “odious” and repulsive. Just a cursory look of Keating’s biographical history shows he grew up with and has benefited from white privilege. Does he really want us to see him as a victim of discrimination? Keating’s argument also presupposes that those people who put together the state constitution were so dumb and such extreme anti-Catholic bigots they didn’t understand the sweeping nature of the language in Article 2, Section 5, which is simply false. This is actually a tremendous insult to those who met in 1906 to put together the Oklahoma Constitution. Keep in mind, the Blaine Amendment was initially proposed in 1875. That’s a 31-year difference between that event and the initial work on the Oklahoma Constitution. It’s obvious that three decades later the intention and language of the section, no matter what its first roots, would have been completely separate from what was going on in 1875. But it’s the argument’s overall premise that should really make people cringe. Here’s Keating’s simplistic premise: Article 2, Section 5 was based on discrimination against Catholics and so therefore we should do away with it and allow a religious monument to be erected on the public square under the same right-wing Protestant view that generated such discrimination in the first place. Southern Baptists, in particular, were widely known to be at odds with Catholics in this country until even the 1980s. That’s well established and was even an issue in the Civil Rights Movement in the 1960s. Southern Baptists and Catholics now share a right-wing political agenda in this country, officially opposing abortion, for example, so Article 2, Section 5, even if it were initially and entirely based on an anti-Catholic school sentiment, now has actually united the two religious denominations in opposition to it. In other words, Keating’s take on the history of the so-called “Blaine Amendments,” even if it were true, which it isn’t, is no longer applicable. Ritze, a Protestant, and Keating, a Catholic, want the same legal and/or voting outcome. There’s no operative discrimination in place specifically against Catholics because of Article 2, Section 5. How can anyone with Keating’s educational background not understand that? It’s all enough to make your head hurt if you think too much about Keating’s tortuous argument. The bottom line is that Keating and the newspaper want an exclusive religious monument at the state Capitol to promote and publicly sanction the Judeo-Christian tradition. That’s the real discrimination going on here.